At about 11:30pm, 11.12.12, I took 12 frames of Orion with my Canon 600D and 50mm. F2.8 standard lens. with 90 sec. exposures. Because the lens covers quite a large area of sky with fairly dark at the top of Orion to lighter and more orange at the bottom, it was extremely difficult to get rid of the gradient without also getting rid of the detail. I think the result is quite good considering that it was taken from my garden with all the light pollution of Doncaster surrounding me. A Report from Peter of general observing from the small dome at the Austerfield Observatory, while others, Dave and Rhys, were using the large dome for DSLR work. This is a further step on my journey to getting the hang of the Canon 550D. Not as straight forward as my SX cameras and taking more time than I though it would. On the other hand I suppose getting the hang of the SX ones took some time too, but it's all too far back in time to rememeber. 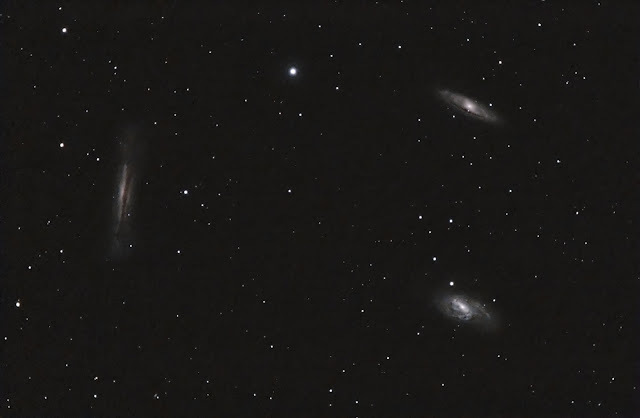 This one was taken on the 18th of November from the Austerfield Observatory, using the 550D and FSQ106, sat on the 900GTO mount. Guiding was not necessary as the exposures were a series at 10sec and another at 30sec. 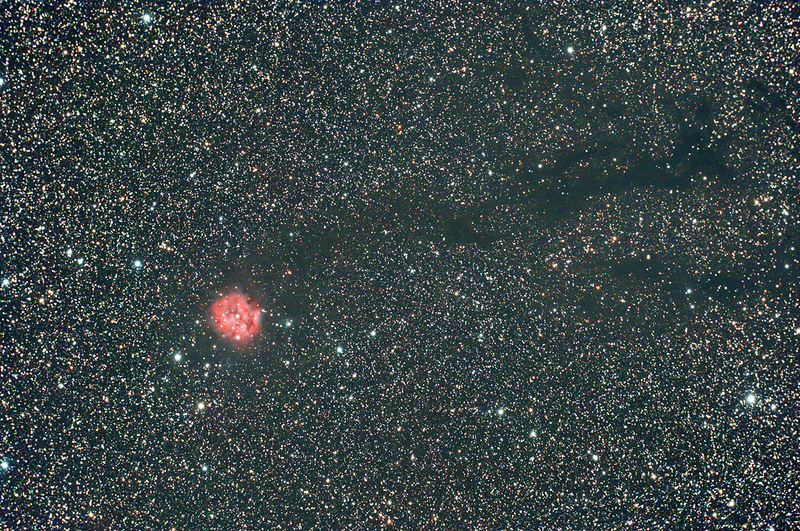 Both were pre-processed in Astroart5 using darks and flats, and sigma average stacked. The final processing was done in Photoshop, and took a very long time. Not to do the actual processing, but to do it again and again, every time I changed my mind. A bit more red, a bit more blue, darker here, lighter there. Sod it! Start again! You know how it goes. This is actually version 8. There will probably be others. In addition to PS I used GradX, can't do without that, and Annie's Astro Actions, a nice set of actions. 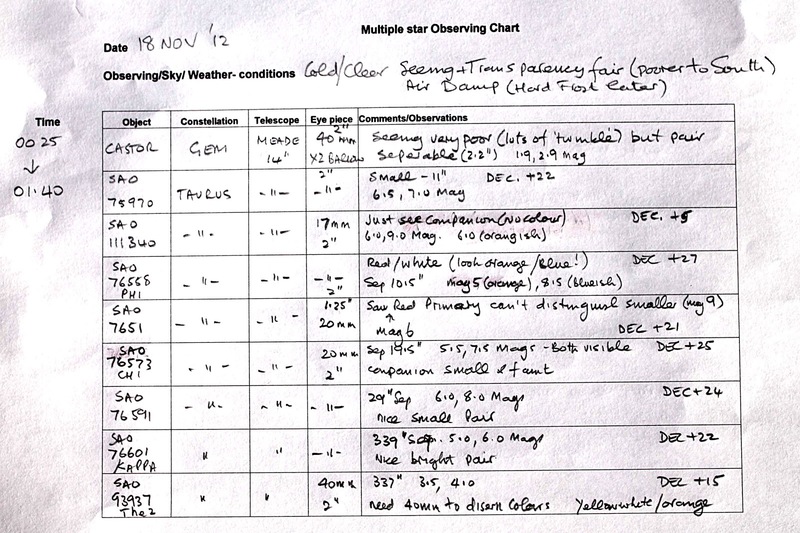 This is an example of the records that Peter Smith makes when observing Double Stars. The form is one he devised for himself and fills out with care to develop a record of his activities. 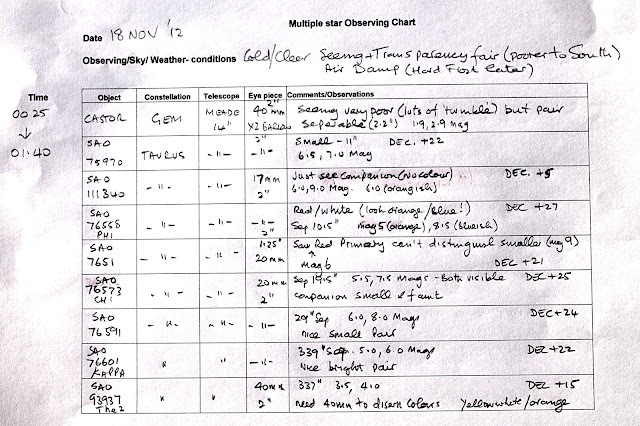 This was done on Saturday 18th of November, when all the other observers had left. The equipment he uses is the Meade 14" with a variety of eyepieces, dependant on the subject under examination. He is very new to the task and has been working visually so far, but plans to progress by adding means of measuring separation and position. 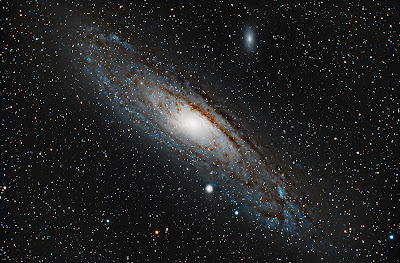 If anyone would like to join him in this escapade, contact him, to make arrangements to meet him there, he has keys to the observatory and is not tied to our normal observing nights. 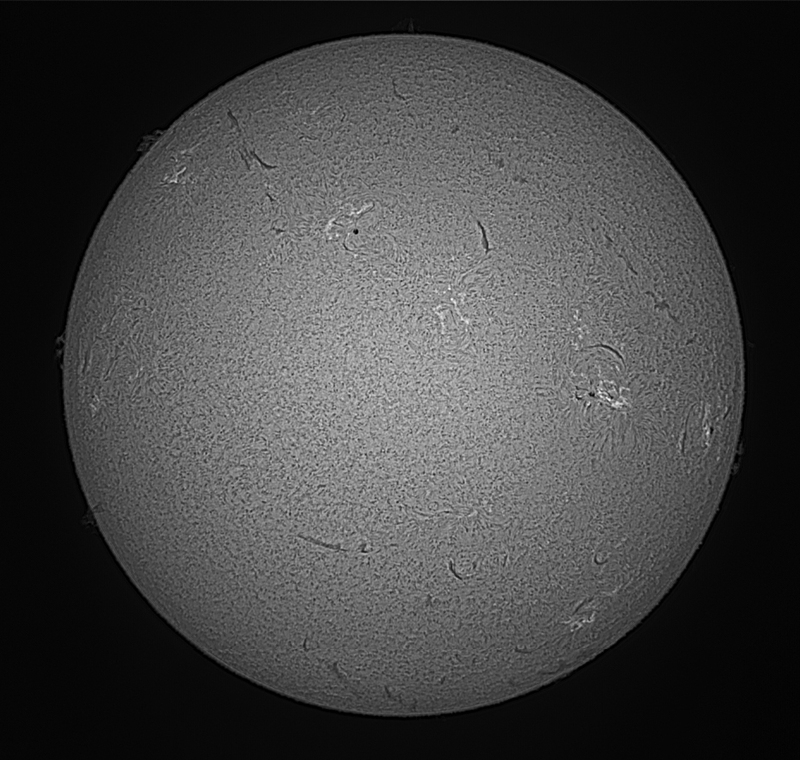 This was taken on 11.10.09, using the William 98FLT and the M25C on the AP 900GTO mount. I have recently spent time reprocessing the frames, hoping that I've now learned more about processing than I knew then. But it's all in the eye of the beholder. 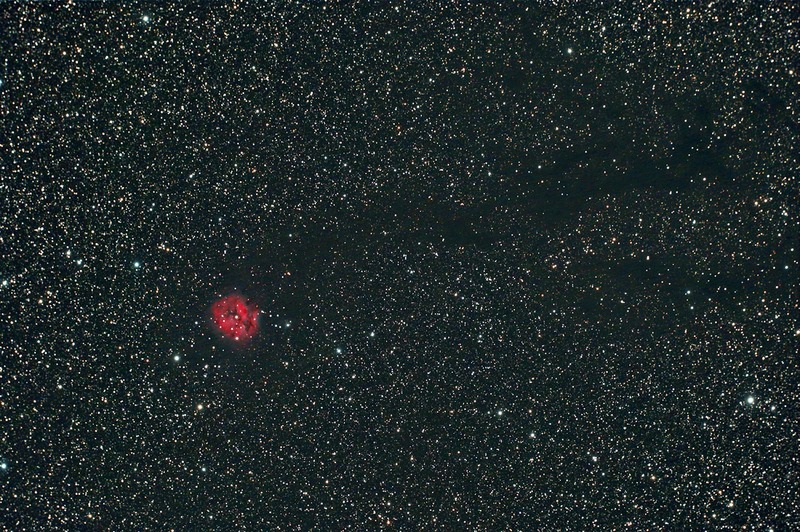 The exposure was 14x600 sec without flats, sigma added in Astroart and finally processed in Photoshop. 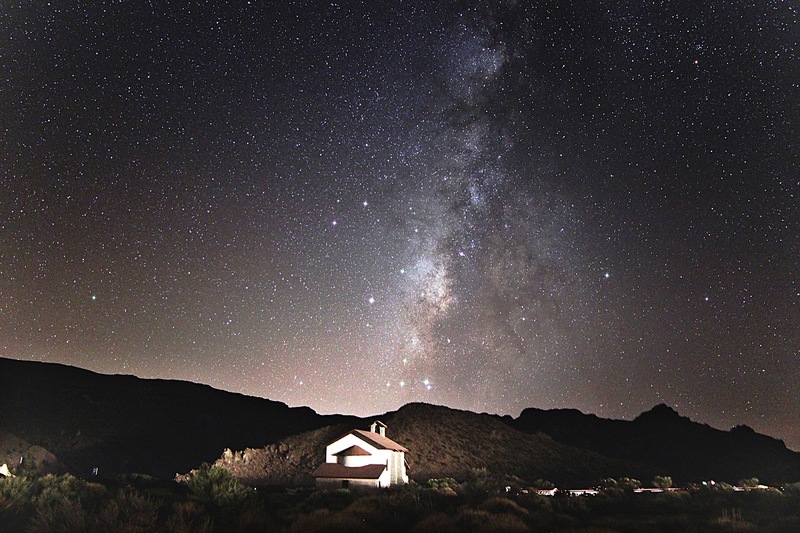 This was taken on 11/09/2012 from the Parador Canadas del Teide, Tenerife at an altitude of 2150 metres, using a Canon EOS 600D with a Samyang 14mm. 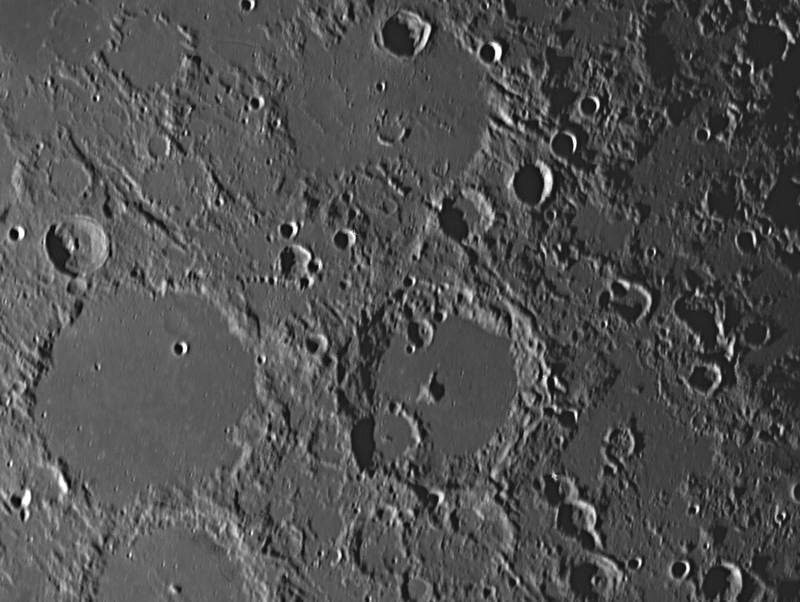 F2.8 very wide angle lens on a Polarie equatorial driven mount. The exposure was a single shot of 49 secs. at ISO 1600. Enhanced with Photoshop Elements 10. We arrived in the late evening very tired after the long journey and the difficult drive up the mountain through cloud and occasional drizzle. At the top it was so clear that I felt I must get some photographs taken in case this was the best night. I thought that this exposure had been spoiled as a solitary car came along the road with its headlights blazing. Fortunately, the final result was good, as the lights illuminated the Chapel and nearby hills briefly enough to get the foreground exposed correctly and not blurred by the movement of the mount. 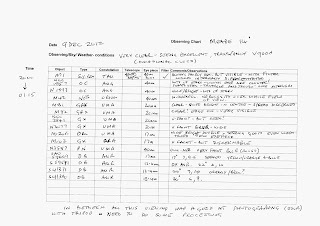 Although this is called the Photo Journal, there is no reason to make it exclusively so, so here is a text report on an activity taken by me, Peter Smith. The sky was clear(ish) so joined Brian at Austerfield at about 9pm for an evening of just looking. 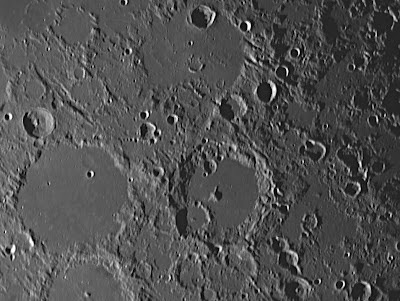 I used Geraldine, the 14" Meade with the Meade 40mm SWA 2" eyepiece and the 26mm 1.25" eyepiece. First a quick check of Alberio to judge the seeing, good, with nice gold and blue shining high in the sky. Then a broad look around using the lists on the wall of the dome. M31 The Andromeda Galaxy was beautiful – clear, bright and wide. M57 The Ring Nebula - nice blue doughnut. N 6826 The Blinking Nebula, winked at me( in blue). 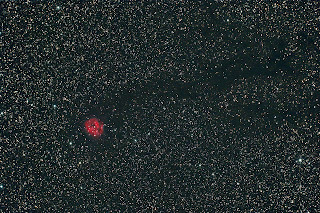 M76 and M27 The two Dumbbell nebulae were quite visible, but difficult to make out the shapes clearly. 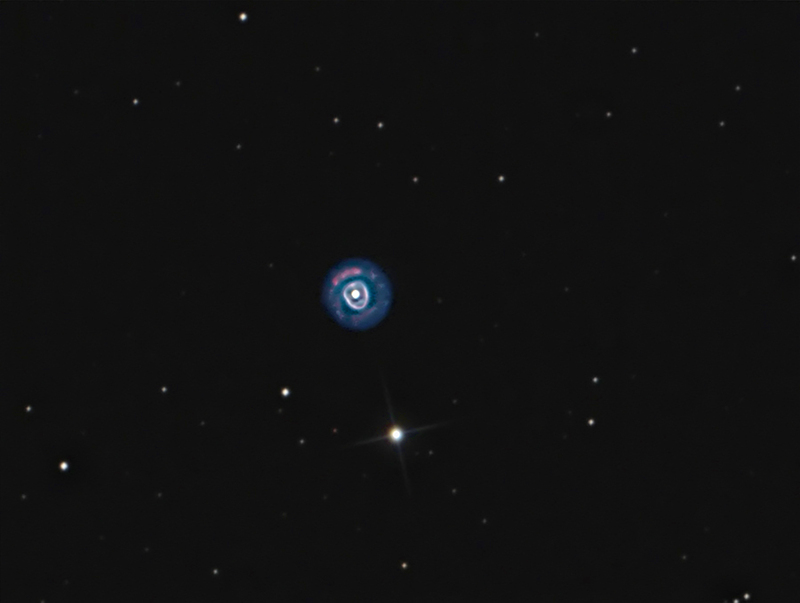 N6543 Cats eye nebula – I was definitely being looked at! Very clear. N7662 The Blue Snowball – blue but small. 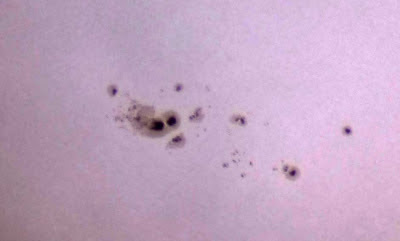 N404 Mirach's Ghost faint but visible - if you move Beta Andromedae (Mirach) out of the eyepiece view (it's very close). 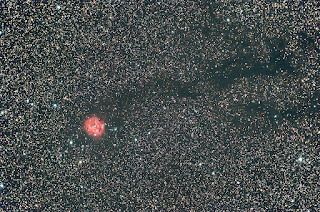 N7027 The Magic carpet nebulae – very small. 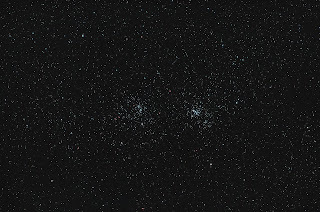 M29 a nice, small open cluster. Neptune – very small but greeny blue. M45 The Pleiades – although I need binoculars – too big for Geraldine. At 11.30 we broke for Tea. When we returned it was still clear but clouds threatening. Tried for Uranus – low and in haze so went for Jupiter. Jupiter very nice, but as I was sorting eyepieces and filters to play with, the cloud god appeared. So, we called it a night and went home. This was taken on the 7th of September 2012 from the Austerfield Observatory, as a test piece for a newly acquired Canon 550D, on the also newly acquired Takahashi FSQ106ED. The exposure was only 17x30sec, whereas my usual for this sort of subject would be an hour. I used the camera's built-in feature for taking darks. 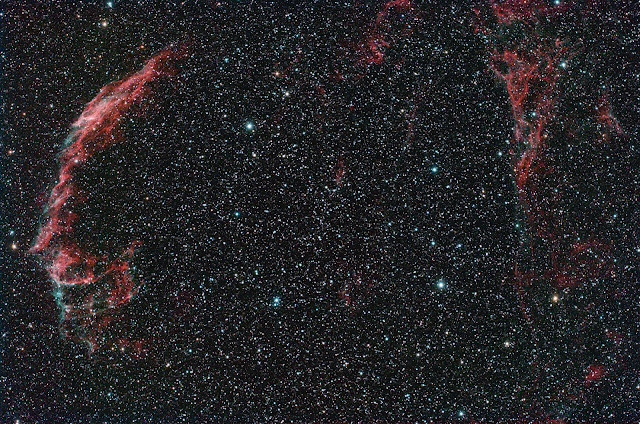 The frames were acquired and pre-processed in Astroart, then finally processed in Photoshop. Colour had to be added for the blue stars and some of the red, but the large red ones had to be reduced in saturation. 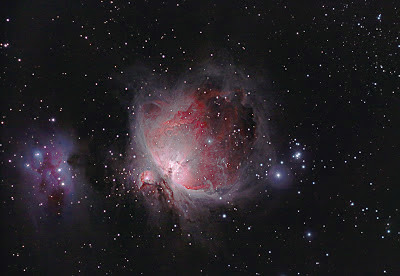 The focusing was done with the aid of Nebulosity and no sharpening was done in processing. Quite a mix of testing was done at the same time in this effort, and as is usual, there was more time spent on processing than on taking the frames. I'm reasonable pleased with the result, and particularly impressed with the tiny stars the combination seems to be able to produce. Taken on 8.9.12 during the first Austerfield Show, in the village of Austerfield about half a mile from the observatory. It was a very hot day for all at the show. The Sun was on good behaviour for a change, visitors enjoyed looking through the Celestron 8" with a full diameter white light filter, which showed quite a few sun spots, but they were most impressed with the Coronado Solar Telescope, which showed a number of stunning prominences. 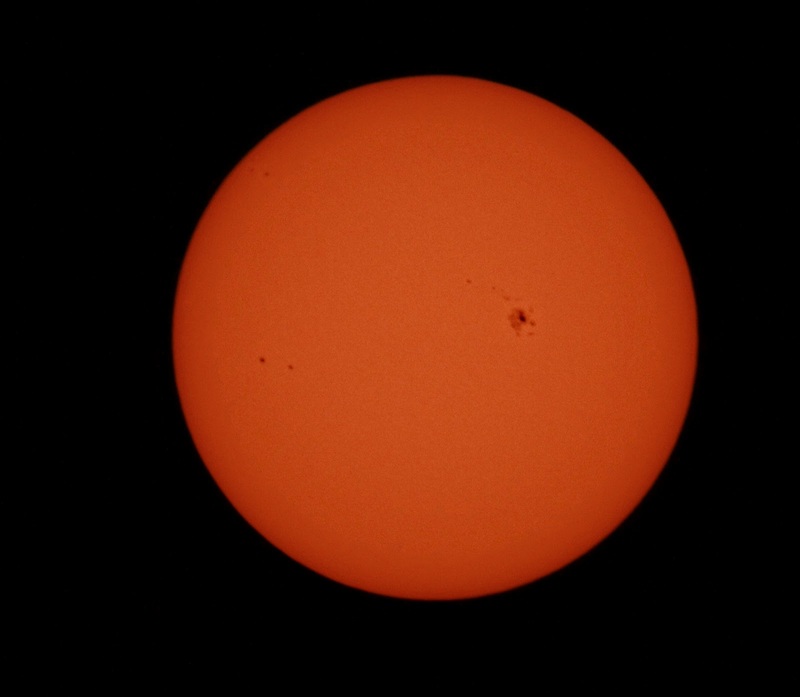 This image was taken at 4:40pm with my Pentax digital camera placed at the Coronado's eye piece. 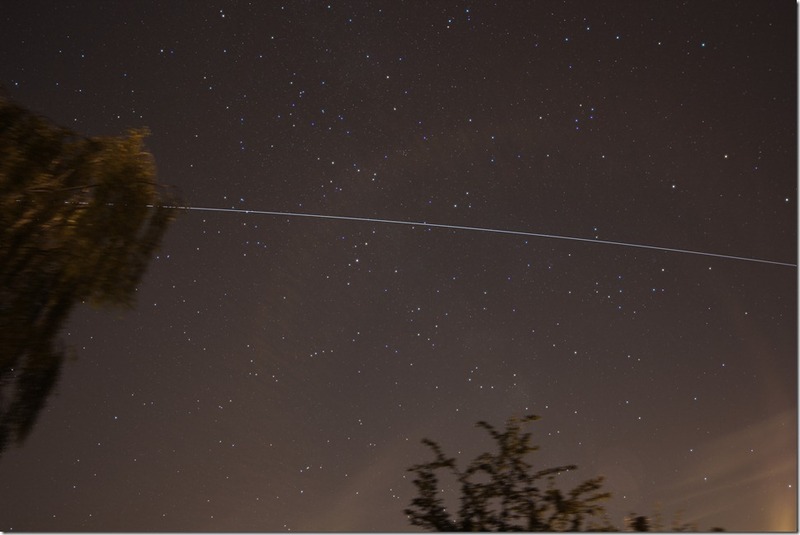 Inspired by Sandra’s printout of the ISS predictions, I saw the ISS on my way home from the meeting at 9:17 pm and set up my camera on its Polaris mount ready for the next pass at 10:52 pm. I used a Canon 600D with a 14mm. F 2.8 very wide angle lens. As it would take several minutes ( 139 secs. exp) to pass through the field of view, I could only use ISO 100 or the sky glow would over expose the photo. I have enhanced it with Photoshop and am pleased with the result apart from the reflection of the street lights and the trail looks broken on the computer screen. If you enlarge it you will see that it is OK and there are a surprising number of stars captured. The satellite is shown passing above Aquila. The trees are blurred as the camera was moving to track the stars. 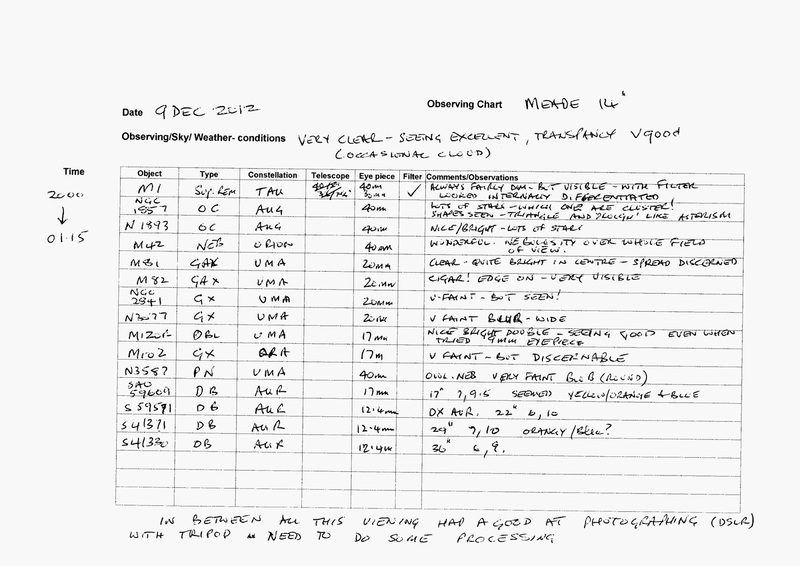 This report was made by Bill Hughes who took the photograph too. A habit of astrophotographers is to keep fiddling, never know when to stop. So this is a reprocessing of the data. No major change but several little bits of fiddling with curves. Is it any better? A matter of personal opinion of course, but I think I prefer this to the others. More frames taken of the Cocoon to make a total of 4 hours 50 mins. The second set wasn't as good as the first but serviceable. I'd lost 5 during the night, one to a lost guide star through cloud and 4 to haze and dawn. I stacked all of the frames together in Astroart, and though it did the job well, I'd have had to crop and reduce the size of the photograph, so I processed them separately then stacked and did the rotating in Photoshop and retained the full size. Hopefully the difference is apparent. Taken 23.7.12, on a good clear night when the Milky Way was easily seen right across the sky, from Austerfield. This is in a part of Cygnus, full of stars, being in the middle of the Milky Way band. 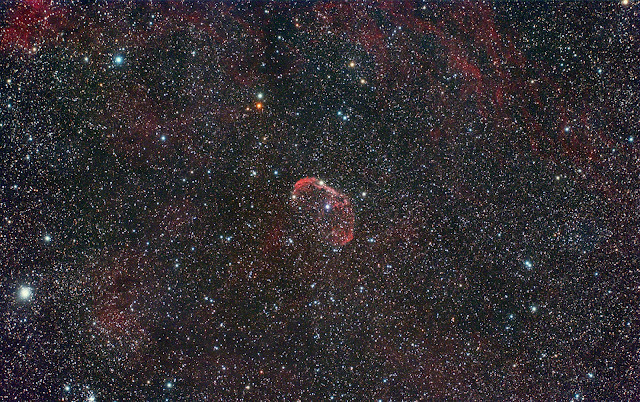 The nebula is known for the dark nebulosity, Barnard 168, flowing round it and westwards from it. The how? SX M25C camera in a William 98FLT, guided by an SX H9C, both on an AP 900GTO mount. The exposure was 36x300sec. 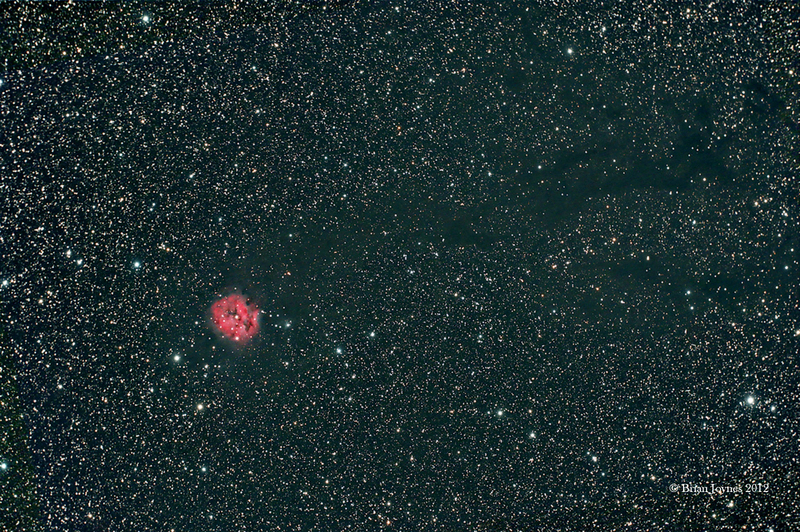 Acquisition and calibration with flats and biases in Astroart, with final processing in Photoshop. Taken on 18.7.12 with a Canon 500D through the WO 98FLT, on the AP 900GTO mount at Austerfield. This is my first attempt with the 500D, and the night was reasonably clear if only for a short while, but a joy to be able to work on something other than the Sun. There is quite a lot of local light pollution so I always use an IDAS filter and fitting one to the Canon caused some thought. But I obtained a filter holder from Gerd Neumann, connected it to a M42x1 thread to Canon adapter. I haven't an easy means of connecting my usual field flattener and you can see the result of doing without it. I'll have to sort something out for that. I used the 500D's built-in capability to take darks rather than take them separately, as the clear sky wasn't there for long. No flats taken either as this was taken to test possibilities. 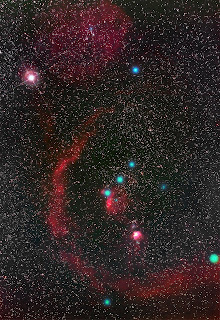 Stacked in Astroart and processed in Photoshop CS2. The exposure was 10x60sec set at ISO400. 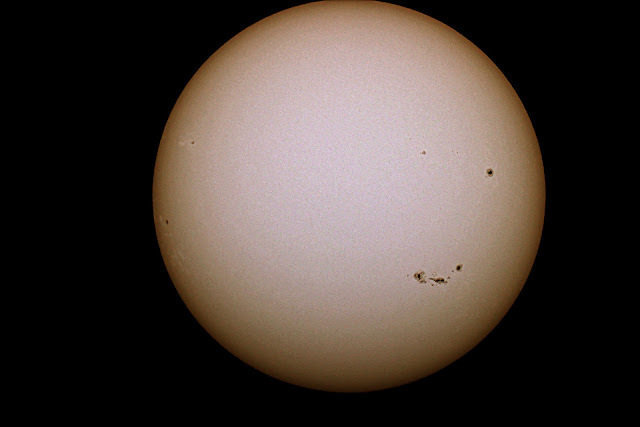 A group of sunspots taken yesterday 11 July a single exposure 1/100 sec canon 450d using a skywatcher 150mm and baader solar film. This is a first venture into astrophotography by Bill Hughes, using a Canon 600D in a Sky-Watcher 127MC and a homemade white light filter made from Baader film. A single shot, the setting were 1/1000sec at ISO400. Processed in Photoshop Elements 10. Taken by Dave Hardware yesterday soon after 10pm, with a Canon DSLR through the murk on the horizon as it rose in the south east. Taken on 27.5.12 from Austerfield, with the M25C in the WO98, under a cloudless though hazy sky. The guiding was difficult to set up till I remembered I'd been photographing the Moon earlier and had set the mount speed to Lunar and not re-set it to Sidereal. 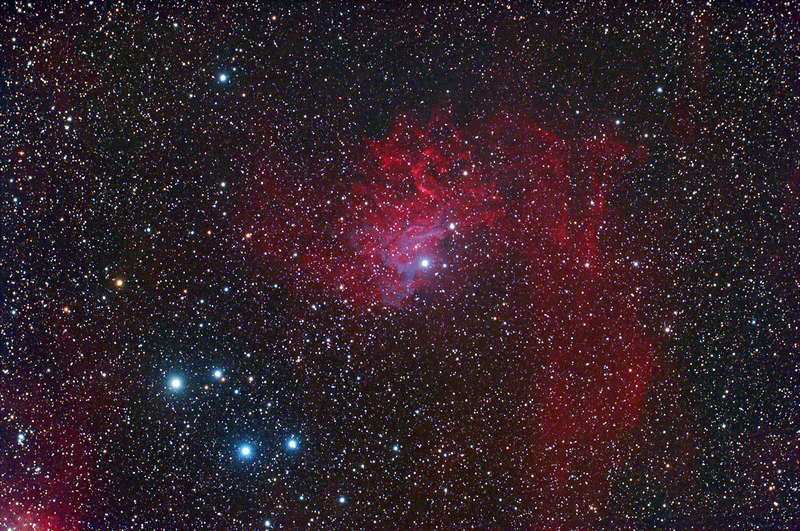 It was acquired and pre-processed in Astroart and finalised in Photoshop without sharpening. The exposure was 13x600sec, but as always more time would have been better. Another clear night last night, 26.5.12, though very summer short. Anything later than 2:30am was spoiled by dawn, and I lost 3 frames for that last night. 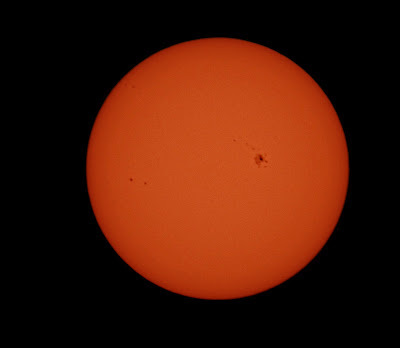 The usual kit was used, the WO98 telescope and the M25C camera. Very pleased with the camera, but I'd like smaller pixels. The time on this photograph totalled 13x300 = 65 mins, not at all enough for the subject, but better than cloud cover. I could repeat the exercise another night to increase the total time, but I think I'd rather try another subject if it's clear again tomorrow night. Always that dilemma. So much to do, so little time. Astroart5 was used to acquire and pre-process the photograph, and Photoshop CS2 to do the rest, which is always more with shorter overall exposure time. 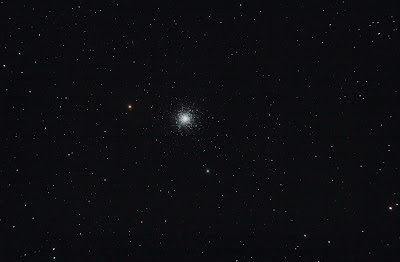 The Vixen VMC260L and H9C were used to guide with Astroart. I keep meaning to try PHD but haven't got round to it yet. Taken on 22.5.12, from Austerfield using the DMK 31 camera and the PST, mounted on the Vixen on the AP 900GTO mount. 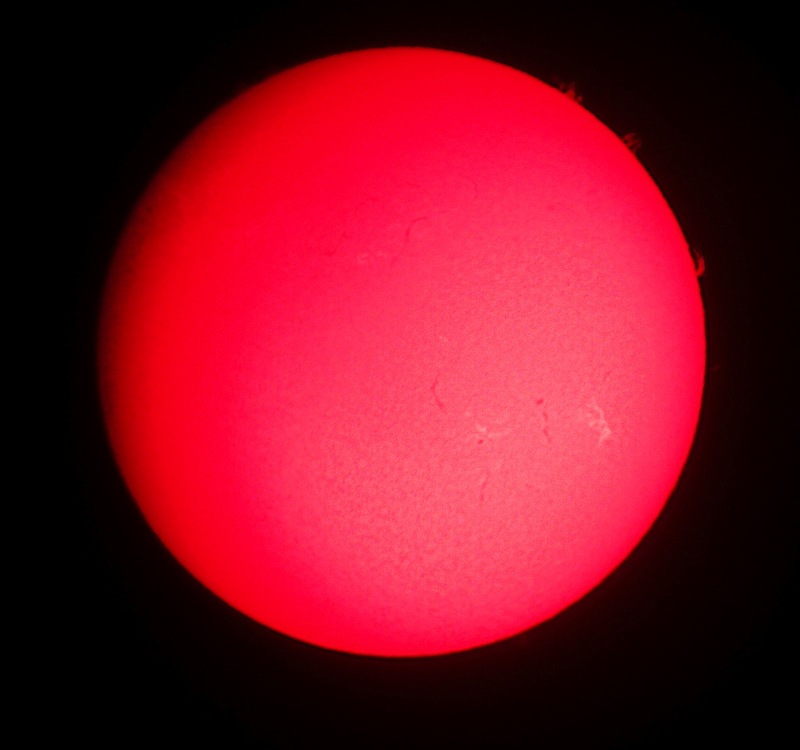 The processing was done in Registax 6. The sky was clear and hot, after a month of terrible weather, but there wasn't much wobble as could be expected on such a hot day. This is an addition of two nights' work, the first on the 23 June 09, and the second, last night 25 May 12. both taken with the same kit of course, the WO 98 with FR carrying the M25C, guided by the H9C in the Vixen VMC260L. Both taken under cloudless skies, though last night's sky was hazy and a bit too close to dawn, in fact I lost 5 frames to the rising dawn. Pre-processing was done in Astroart as was the matching and averaging of both sets of frames. The final tweaking was done in Photoshop CS2, without sharpening. 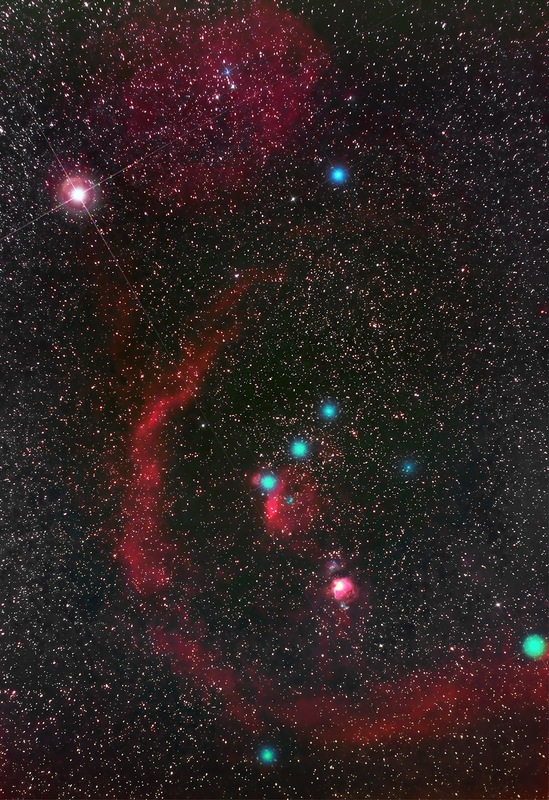 There is an abundance of glowing hydrogen all over the frame, several dark areas, dust clouds, and stars too. Just above the nebula is a couple of bright stars, the red SAO69636, a Carbon star, and the blue SAO69635 above it. Not sure if they are related. 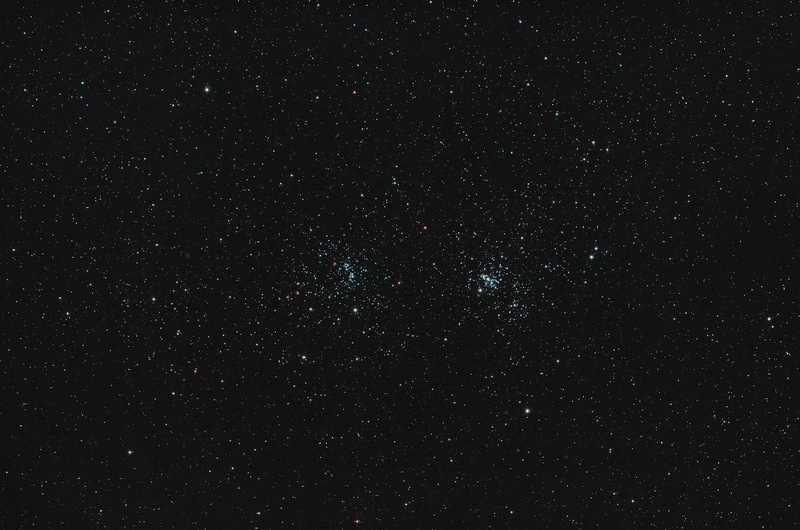 At the lower left is a small Open Cluster NGC 4996. All this is located on the spine of the Swan, just below the cross of the wings, with the Milky Way running through it. 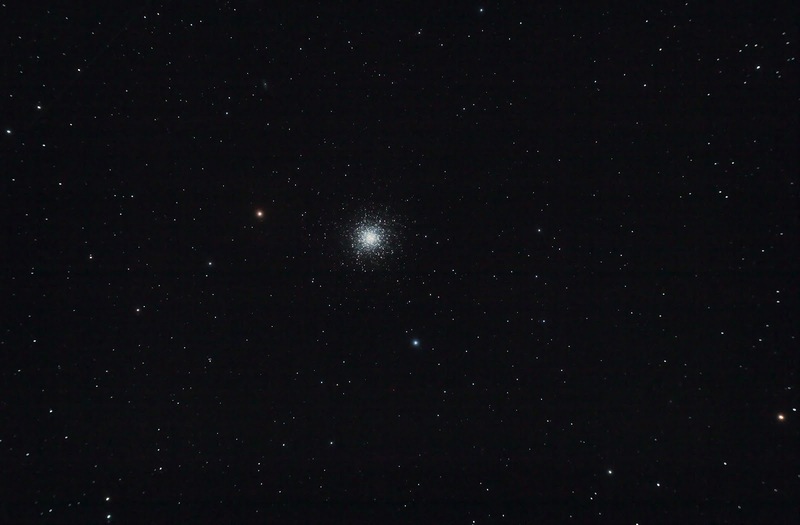 Taken by Eddie Marris, using a William 132, with his DSLR set at ISO 800 and 3200th of a sec. Processed in Photoshop. Eddie's photograph is a good celebration of the end (hopefully) of a month of cloud and rain. We are in what the enlightened ones have officially pronounced a drought, so, of course, the rains poured down for days on end, to the effect that we've recorded the greatest rainfall for April almost since records began. Rivers overflowing and floods everywhere, but it's still officially a drought. 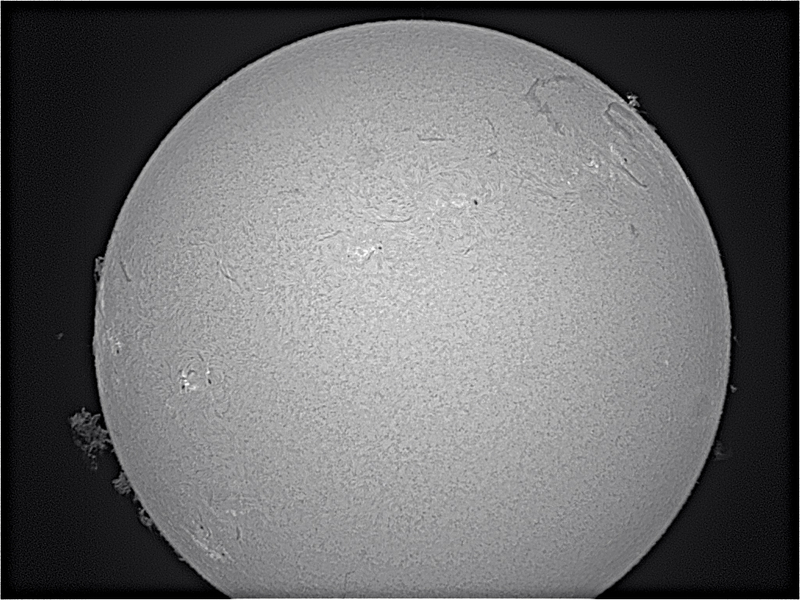 All this means that there haven't been any clear nights for astrophotography. I'm beginning to suffer withdrawal symptoms, and fear I'll have forgotten how to do it all when the skies clear. Taken on th 14.1.12 with the DMK31 in the Vixen260. Processed in Registax6 and Photoshop. The M25C was given a rest and the usual guide camera, the H9C took centre stage, in the Vixen260. The guiding was done by the WO98 and M25C instead. though hardly needed. The exposure was 19x90sec. 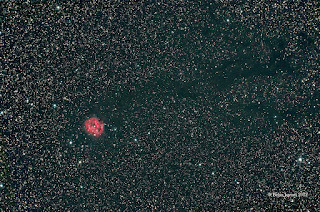 Acquisition and preprocessing was done in Astroart with final processing in Photoshop. The photograph was taken on 5.01.12. Taken on 30.11.11, with the DMK31 in the PST, mounted on the 900GTO. 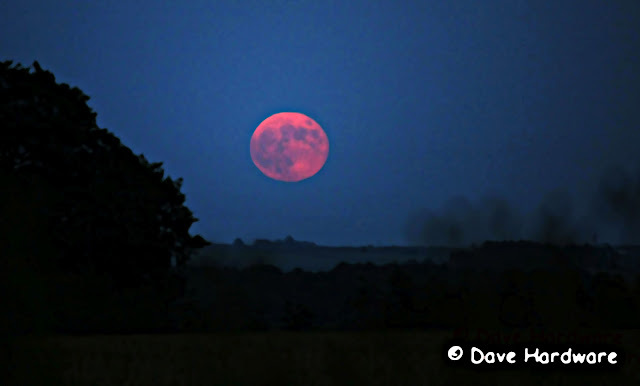 Processed in Registax6 and finished off in Photoshop. The PST is a very good version indeed of this telescope, their quality/setting varied quite a lot, piece to piece. Taken on 17.12.11 with the M25C in the WO98, guided by the H9C in the Vixen260. The exposure was 23x300sec. It was acquired and calibrated in Astroart and finally processed in Photoshop. Taken on the 14th of April from Austerfield using the usual kit, M25C in the WO98﻿, guided by an H9C in the Vixen260. 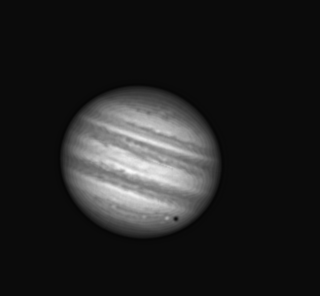 But this time I added a Televue 2x Powermate to the 98 to get up closer. I've used this combination a long time in the past with poor results, so have avoided it. But this time I've had a modicum of success so will continue with it. This effort, for instance, needs more time and I'll do that when the skies agree. 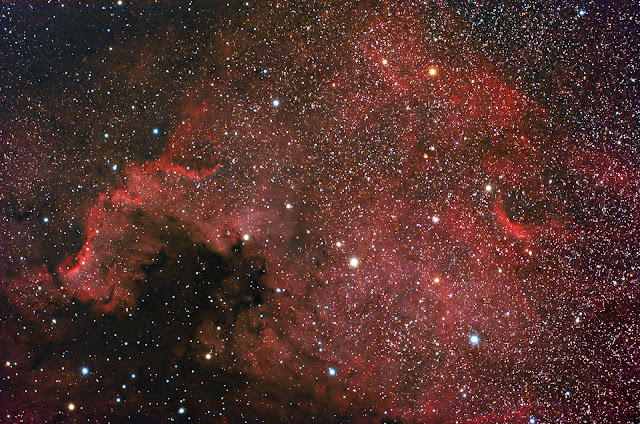 The processing followed the usual practise, acquisition and pre- processing in Astroart and final work in Photoshop. The exposure was 19x300sec and extended into the murk in the west, so includes more noise than I'd hoped.